New York City is so big that it provides nearly a slice of everything that is possible in this world. So it should come as no surprise that the Big Apple has a doom/stoner band like Earthbound Smoke Ghost dwelling in the city that never sleeps. In describing Earthbound Smoke Ghost's style it is easy to say that one should imagine the doom style of Cathedral without the overt Black Sabbath influences and more of a stoner vibe to it. It's heavy as doom should be, but perhaps with a little more speed and variety in the pacing. Guitarist Marcos Drellana lays the psychedelic tones on thick with washes of flanger, chorus, and echo. Bassist Jeff Scott and drummer Dalton achieve a nice balance between tight and loose feels that gives the rhythm section diversity and flexibility. Vocalist Pheroze has a bit of a Sully Erna inflection in his voice, but sounds nothing like him; I repeat - it doesn't sound like Godsmack at all. The four members of Earthbound Smoke Ghost actually sound like they were meant to be together creating music. Without any label support Earthbound Smoke Ghost have put together a quality package of five songs, great artwork, and a professional approach. Even people who wouldn't necessarily say they were fans of the doom or stoner styles would appreciate Earthbound Smoke Ghost's "Karma's Grave." Fans of Spirit Caravan, Cathedral, and early Anathema will enjoy Earthbound Smoke Ghost. "Karma's Grave" was produced by Earthbound Smoke Ghost; "Karma's Grave" was engineered and mixed by Jay Kanter. The production and overall sound is clear and discernible. 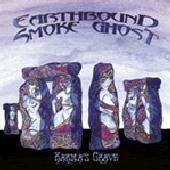 Earthbound Smoke Ghost is Pheroze on vocals, Marcos Drellana on guitar, Jeff Scott on bass, and Dalton on drums. For more information visit http://www.earthboundsmokeghost.com.